As AT&T's iPhone exclusivity reluctantly teeters on the brink of oblivion, it seems a good time to take one last look at the smartphone playground, the way it is before V-Day. 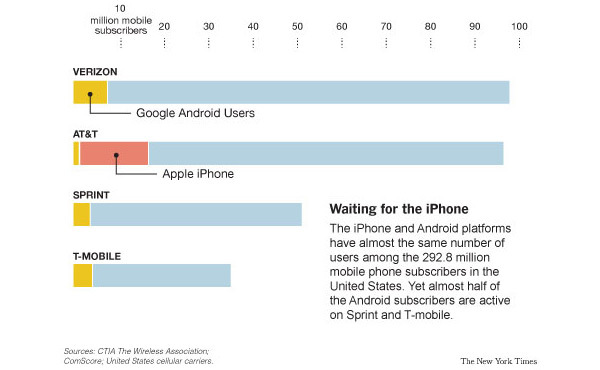 The New York Times has handily done that job for us with the above chart, which simultaneously gives us a sense of scale when comparing US carriers and lays out the concentration of Android devices across those networks. It also shows a big fat bump of iOS on AT&T, making it the biggest carrier in terms of combined iPhone and Android users -- nothing shocking there, but the real fun will be in taking a look at this same data a few months from now. Will the iPhone fragment itself all over the four major networks? Will AT&T's Android stable ever be respectable? Tune in to your next installment of "fun, but mostly irrelevant statistics" to find out.